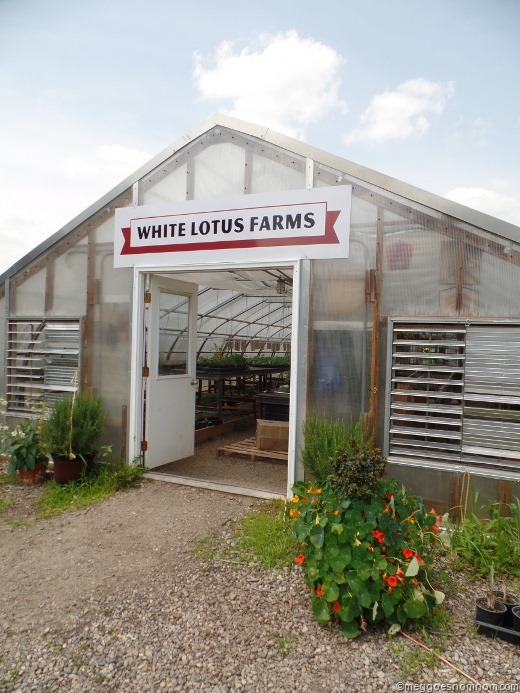 If you live anywhere within the vicinity of Ann Arbor, MI, I highly recommend that you add an item to your Summer 2015 Bucket List: A visit to White Lotus Farms! I’ve been wanting to visit the farm for quite a while. White Lotus Farms first entered my radar last fall, after hearing about several of the ingredients that local restaurant Ravens Club sources from the farm, including produce, baked goods, and cheeses. Located at 7217 W. Liberty Rd, just 7 miles from downtown Ann Arbor, the farm is open on Saturdays 9:30-2:00 PM, May through September. While you’re there, there are several sites to see and culinary delights to tantalize your taste buds. 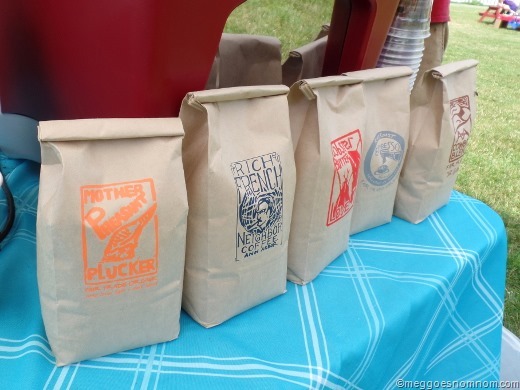 Start with a freshly brewed espresso drink, prepared using local Roos Roast beans! Kat, the headcheese maker at the farm, was working as the barista on the day we visited. 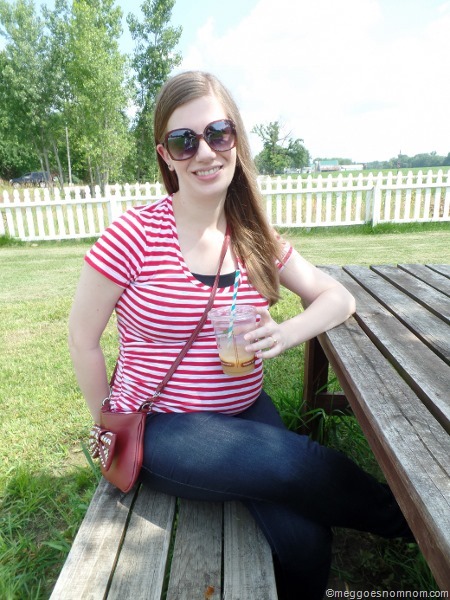 Iced coffee is just about my favorite beverage on the planet, but since I’ve been pregnant I’ve been drinking iced decaf Americanos this summer (since decaf iced coffee just isn’t really a thing at any coffee shop I’ve encountered.) Kat whipped me up a nice strong one that we paired with two Oh!s baked by her husband and head baker, Trinle, at the farm. 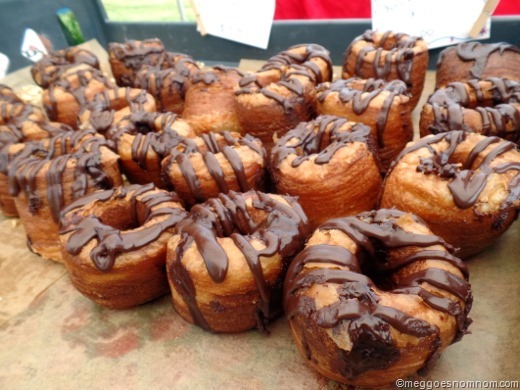 Oh!s are a cross between a donut and a croissant (more popularly known as “cronuts”) and have been hugely popular since their debut at both the Ann Arbor Farmer earlier this summer, and at their weekly farm stand. We finally got our hands on a couple! 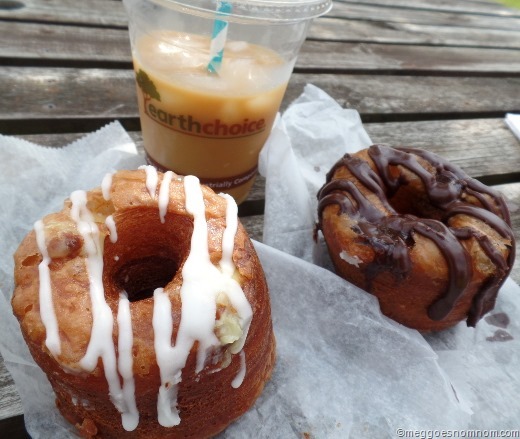 The huz and I split both a lemon cream and a chocolate cronut. Oh! Yes. They totally live up to the hype! First of all, they are HUGE! At least a good 4+ inches tall? The exterior is insanely crispy and crunchy while the buttery, flaky interior literally melts in your mouth, as butter and chocolate ganache drip down your fingers in the best way possible. 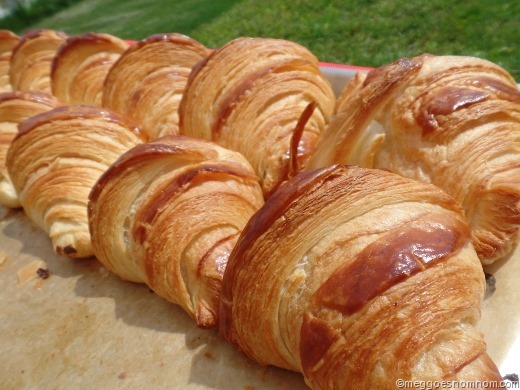 Croissants are also available. Aren’t these just gorgeously flaky!? After our late morning snacks, farm manager Jess took the huz and I on a tour of the stunning grounds. Those who work at the farm are Buddhist practitioners, and members of the Buddhist community volunteer there weekly as well. 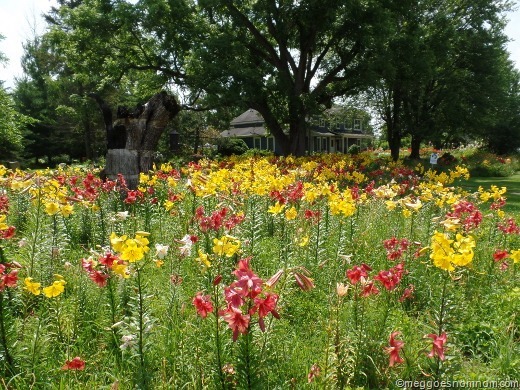 You can see bed after bed of flowering gardens during your visit. 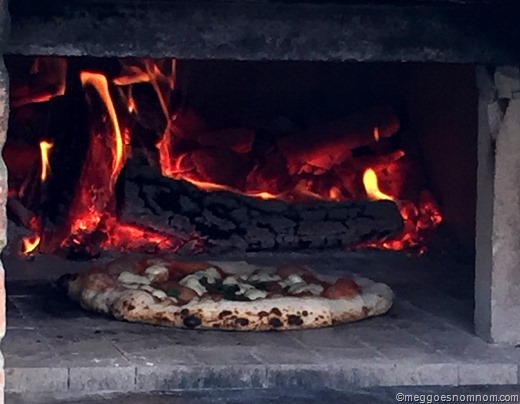 We also got to see the wood-burning pizza oven in action! 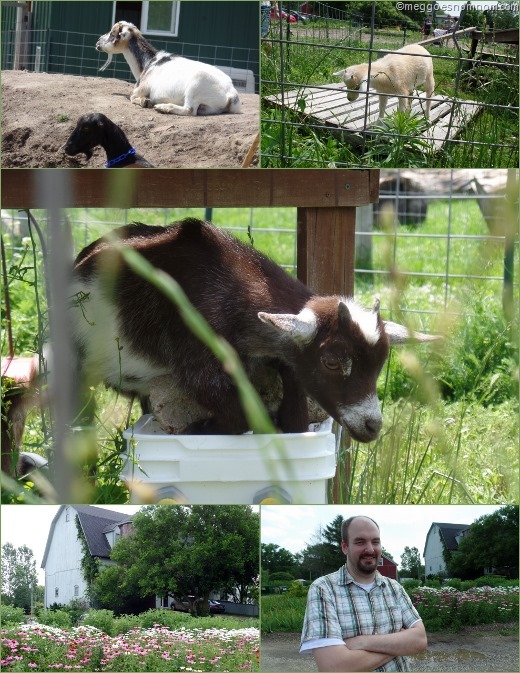 Another highlight of our visit was a stop by the goat’s quarters, a place that 65 playful goats call home at the farm. There were some adorable baby goats as well! 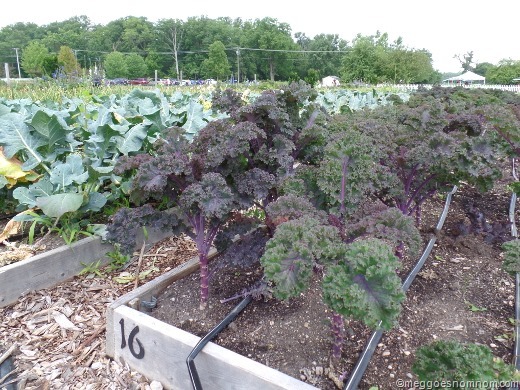 Vegetable gardens – kale and broccoli and so much more. 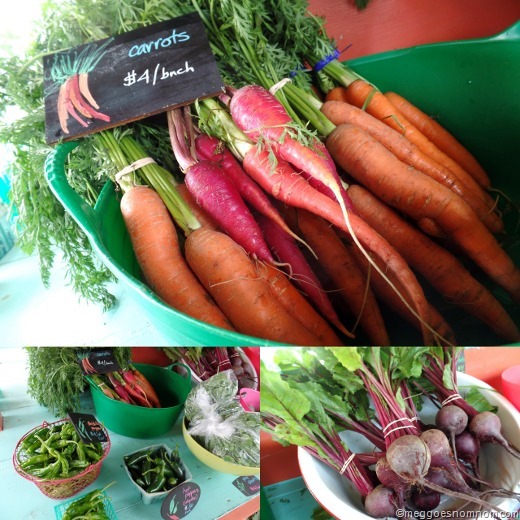 The farm is currently in the process of becoming certified organic and their produce is beautiful. 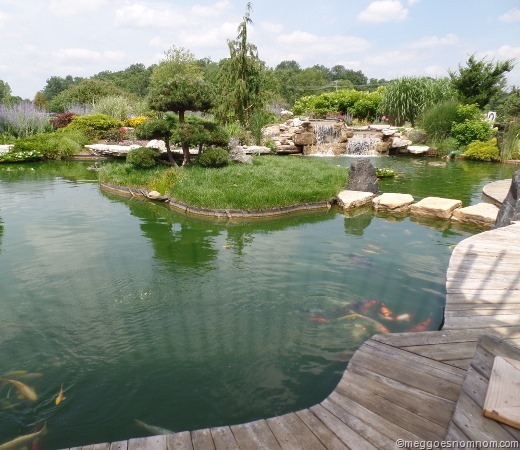 The farms also houses a huge, scenic koi pond with over 150 fish. I could sit here and relax all day. 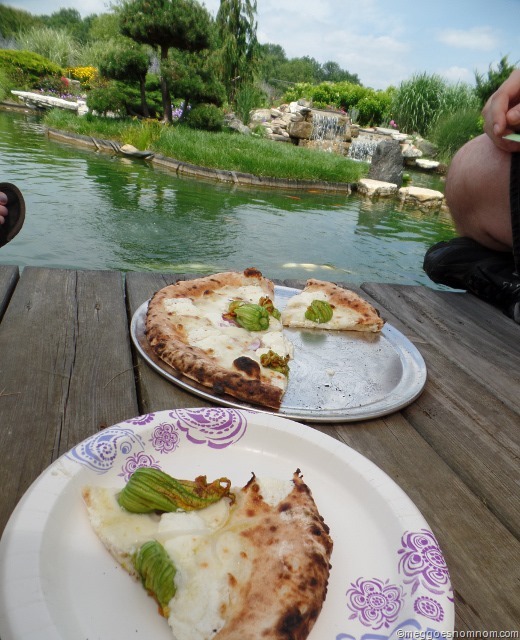 The extremely kind folks at the farms nicely comped a pizza for us to try during our visit – plus a couple bonus slices – which we enjoyed in front of the koi pond. Be sure to time your visit so that you’re able to grab a slice – or whole pie. Trinle bakes the pizzas from 12-1pm on Saturdays while Hans transports them between the farm stand and the pizza oven. My favorite of the three pizzas featured on the day of our visit was the Squash Blossom Pizza, topped with tangy, creamy fresh chevre (goat cheese made from goat’s milk from the farm), fresh mozzarella, lush squash blossoms grown at the farm, and red onion. The head baker also makes the pizza dough onsite, the day before it is served. A drizzle of EVOO tops everything off! 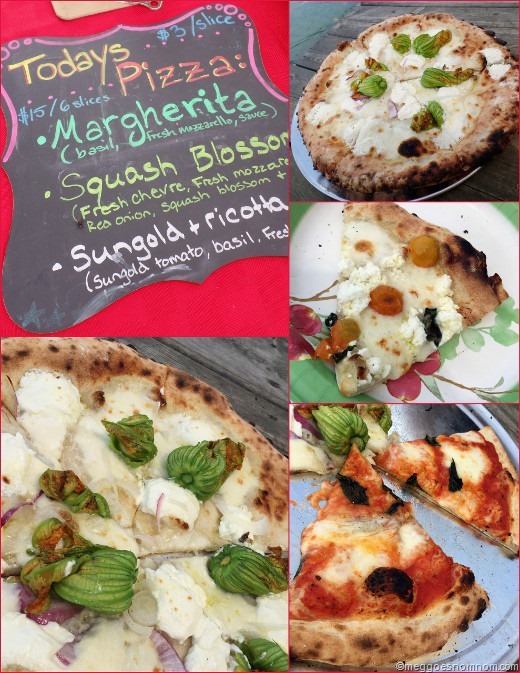 White Lotus Farms’ pizza is very similar to the wood-fired pizza found at Ann Arbor’s revered Mani Osteria (which was actually awarded best in Michigan and is one of my favorite restaurants in town) and WLF’s pizza absolutely stands up to Mani’s pizzas. I love that they utilize as many ingredients as possibly directly from the farm. I can’t thank the kind folks at White Lotus Farms enough for giving us a tour of their grounds and letting us sample some of their wonderful homegrown, homemade foods. We will definitely be back. (I’m already longing for more Oh!s.) Once our little guy is born and is a little older, we hope to bring him in for one of WLF’s monthly Kids’ Days! 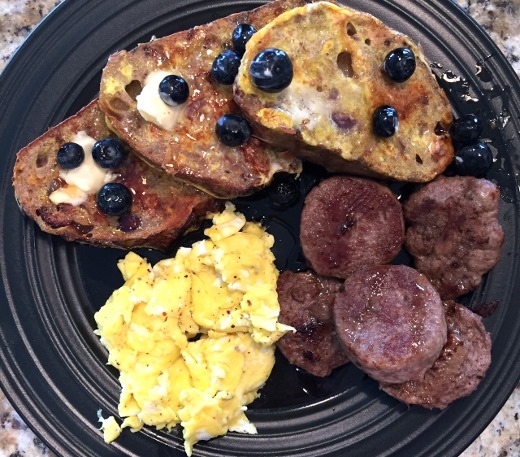 We also picked up some homemade fresh-baked bread made at the farm to bring home with us and I made French toast using the cranberry walnut bread the next day! Check out White Lotus Farms on Facebook and Instagram. Was great to meet you guys! I love the food writing you do; the description of an Oh! “The exterior is insanely crispy and crunchy while the buttery, flaky interior literally melts in your mouth, as butter and chocolate ganache drip down your fingers in the best way possible.” –is perfect… and hilarious! You must be a UM alum… haha I work in marketing/development at LSA. You as well! Everyone at the farm is so nice! We were very impressed by your pizza-transporting skills – what a workout! I enjoyed reading this post ! The food looks delicious.